A Perfect Circle release their 2D hologram video titled, “Eat the Elephant” which is a poetic and dark visual of a man trapped with his own demons. In dark contrast an innocent child sits afloat on her bed spinning in circles, while at one point we can see a visual of her dancing around the bed. The symbolism is dark but in A Perfect Circle fashion reminds us of our frail and futile attempts to escape ourselves. The gas mask plugged into the dark hose entrenched with a black octopus at the end, resembles our inner trappings we wrestle with. At the intro of the song, there is a slight resemblance to The Doors, “Riders on the Storm” however vocalist Maynard James Keenan steadily breaks in with his sultry voice as melodic as a lullaby. The light drum set and piano accompaniment in the background complement Keenan’s vocal capacity. The lyrics, just take the stand, take the swing, take the bite, just go all in. The band was formed in 1999 by guitarist Billy Howardel and Tool vocalist Maynard James Keenan. They have released four studio albums, Mer de Noms (2000), Thirteenth Step (2003), Emotive (2004) and Eat the Elephant (2018). Other band members include James Iha (Tinted Windows, Smashing Pumpkins), Jeff Friedl (Puscifer, The Beta Machine) and Matt McJunkins (Eagles of Death Metal, The Beta Machine). Greg Edwards (Failure, Autolux) is filling in for James Iha on all announced A Perfect Circle shows. The band’s music has been described as a number of different genres, though despite the sound and lineup changes, the writing process has remained the same for the band. 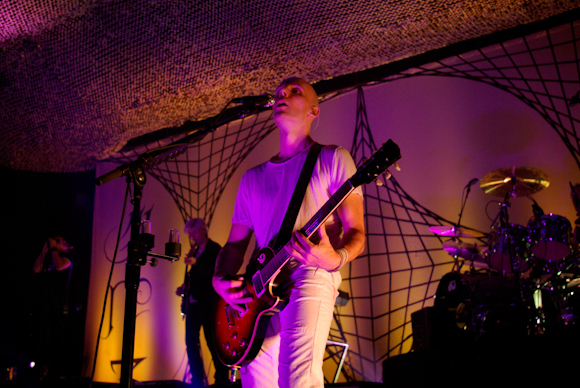 Howerdel primarily writes the band’s instrumental music, while Keenan contributes the lyrics and vocal melodies. Keenan, already very well known for his work with fronting the band Tool through the 1990s, always strove to keep the sound of the two bands different. On a side note, the infamous song, “Sober” by Tool has garnered close to 50 million page views on youtube. In an article from The New York Times in March 2000, Keenan says, “The [A Perfect Circle] music was very different, so I responded differently. The process that we go through in recording with Tool is very organic, but at the same time it is very thought out. There is a very left-brain process of dissecting what we’re doing and drawing from source material; it’s very research oriented and esoteric. With A Perfect Circle the process is far more mechanical and computer oriented, but at the same time it is also far more emotional and intuitive. Tool is more a left-brain masculine result, and [A Perfect Circle] is more a right-brain feminine result. This week, A Perfect Circle announced their participation in Record Store Day’s Black Friday festivities, offering a limited edition 7-inch featuring “So Long, And Thanks For All The Fish” with a B-side of the AC/DC cover “Dog Eat Dog.” November 24 and 25 will find music fans cramming into independent record stores across the country in hopes of an exclusive chance to purchase new music, some of which is extremely rare.